Off to Mississauga again today. Here's a photo from my wandering yesterday. I'm getting a hang of my camera. This is, obviously, historic Massey Hall on Shuter St in Toronto. Off the top of my head, official (ie--non bootleg) live recordings from Massey Hall include Neil Young and Tears for Fears. I'm a big fan of light trails, so obviously this is a long exposure. I will post more photos from my afternoon trek around the city in tomorrow's post. Click to enlarge the photo, as always. 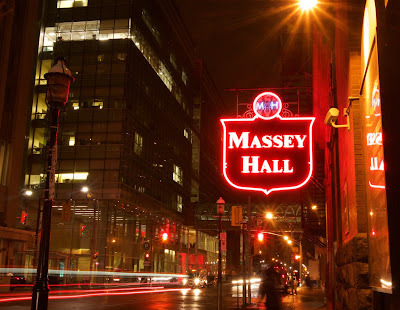 Massey Hall, Toronto, December 9, 2015 at 6:57 PM. I was originally across the street, but a car stopped in front of my tripod set up, so I moved. Turned out to be a better shot. It was starting to rain and I was worried about my camera, so this was the last shot of the day. ISO 200, f/16 (to keep everything nice and sharp and create light trails) and shutter speed 3.2 s.